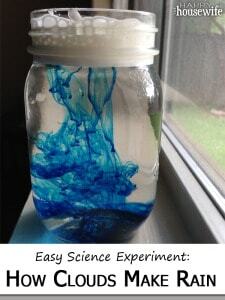 Rainy day science activities that can be done at home with everyday household objects. 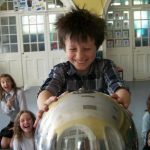 Prevent kids from getting bored and get them excited about science! SAFETY ALERT- some experiments may include chemicals that could be dangerous if swallowed in large quantities (e.g. oil) so adult supervision is required at all times. This is a fun experiment that allows kids to get creative. All you need is milk, white vinegar, a bowl and a strainer . You may also need to put down some paper for this one as it can get a little messy! The idea is to heat the milk in a pan so that it becomes warm (this will require adult supervision) then add a cup of vinegar to the milk and stir for about 1 minute. The mixture then needs to be strained over the sink- be careful it may be hot! You will start to see lumpy blobs that have been left behind. As if by magic you have made Casein which is Latin for Cheese. Casein occurs when the protein in the milk meets the acid in the vinegar. The casein in milk does not mix with the acid and forms blobs. What’s more once the blobs have cooled down you can push all the left over lumps together which can then be molded to make your own shapes- be creative and let the kids imaginations run wild! Why not add some food colouring or try adding other acids such as orange or lemon juice or you could even try different types of milk such as Soya and low fat. All you will need for this experiment is a balloon, some string, a plastic straw and some sticky tape. The idea is to tie one end of the piece of string to a chair or door handle. Then feed the straw through the piece of string and tie the other end of the string to another support in the room. You will then need to inflate the balloon, but it is essential that you do not tie the balloon to ensure the experiment works. Finally you need to pinch the balloon and attach the tape to the balloon which can then be attached to the straw. Pull the balloon right back to the beginning of the string… then FIRE as you watch the rocket fly through the air. As the air rushes out of the balloon, it creates a forward motion called THRUST. Thrust is a pushing force created by energy. In the balloon experiment, our thrust comes from the energy of the balloon forcing the air out. Different sizes and shapes of balloon will create more or less thrust. In a real rocket, thrust is created by the force of burning rocket fuel as it blasts from the rockets engine – as the engines blast down, the rocket goes up! Why not try different shaped balloons and different lengths of string to keep your kids entertained. For this experiment you will need water, a clear plastic bottle, vegetable oil, food colouring and Alka- Seltzer. 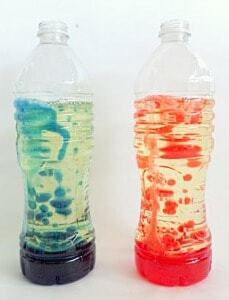 This is an entertaining experiment which can be done using any size/type of bottle and any colour of food colouring. Firstly, you need to fill the bottle with water so that it is about 1/4 full. Then, add the vegetable oil leaving a small gap near the top of the bottle. You will then need to wait a few moments for the water and oil mixture to separate. Next add a few drops of food colouring. The next part is really fun! Add the Alka-Seltzer to the mix and everything will start to change. Continue to add Alka-Seltzer as it will keep the reaction going so your kids can enjoy the lava lamp for longer. You could also try shaking the bottle once all the bubbles have stopped to see what happens. Also, shine a torch underneath the bottle (ensuring the lid is on the bottle) at night time to see what happens to the mixture. The oil and water you added to the bottle separate from each other, with oil on top because it has a lower density than water. The food coloring falls through the oil and mixes with the water at the bottom. The piece of Alka-Seltzer tablet you drop in after releases small bubbles of carbon dioxide gas which rises to the top. The gas escapes when it reaches the top and the coloured water falls back down. 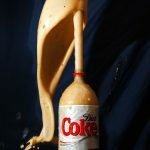 The reason Alka-Seltzer fizzes in such a way is because it contains citric acid and baking soda (sodium bicarbonate), the two react with water to form sodium citrate and carbon dioxide gas (those are the bubbles that carry the coloured water to the top of the bottle). This is a really easy educational experiment that is made using household objects- and its fun! All you will need is shaving foam, a jar, water and food colouring (blue is best to represent the rain drops). First of all you will need to fill the jar with water almost to the top. Then, cover the gap with shaving foam which will act as the ‘cloud’. Start adding small drops of food colouring into the foam until drops start to fall from the cloud. This will look like rain as the water collects the rain from the cloud, until it can’t hold any more, then it will begin to leak through the cloud exactly like rain does. Prepare to get messy with this experiment- you may wish to change into some old clothes. For this experiment you will need some craft glue, disposable cups, food colouring, water, Borax powder (available at most supermarkets near the washing powder). First you will need to fill one of the cups with water and add some Borax powder- stir and leave to the side. Add 2.5cm of glue to the other cup, add three tablespoons of water and stir. 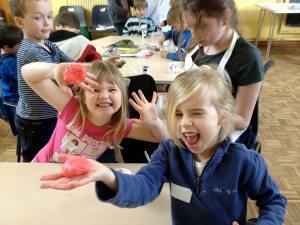 You will then need to add some of the food colouring to the glue mixture and stir. Then, you need to add a tablespoon of the Borax solution you made earlier and make sure you stir well. You have now created slime! You will need to leave the slime 30 seconds before your children can play with it- it can be used again and again- just keep it in a tightly sealed bag. Also make sure that your children wash their hands after they have played with the slime. 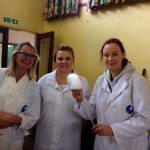 If you can’t find Borax Power check out the link below for alternative ways of making slime without Borax.